the other day, my friend nette was in the neighborhood and asked if she could see my unit, and i hesitated, telling her there was nothing to see, although in truth, there was actually lots to see: the chaos of my procrastination, delaying on the purchase of furniture that i terribly need, such as a shelf for my books, and all the other things that have ran out of enclosed spaces to hide in that they end up on the floor and on one of my few chairs, or on the only table that i have. but at least my place was reasonably clean compared to other days so i welcomed her to the place where i live, and of course her first comment was the disorganization of my room, the dirty dishes sitting on the sink, and the corner behind my bike filled with empty paper bags, umbrellas, and i don't know what else. she also noticed my books. i have a few books here in makati: the ones that i'm currently reading or want to read. all the rest are in quezon city where at least i have a proper shelf although that is also quickly running out of space. she asked me what books i had, and i showed her what i was currently reading: gabriel garcía márquez's autumn of the patriarch, along with a few other books by him and other authors. "okay ba tong si gar-sha marquez?" she asked, flipping the book over. "he's my favorite author," i replied. "pahiram naman, para makabasa ako ng iba," she said. "baka hindi mo siya magustuhan." "hoy, ano'ng akala mo sa akin? nagbabasa naman ako noh. kay grisham nga yung binabasa ko ngayon!" i immediately thought about magic realism, and garcía márquez's predilection for writing really long sentences, and i replied: "baka first page ka pa lang, itapon mo na yan." "grabe ka!" nette said. "pahiramin mo ako ng madaling basahin." 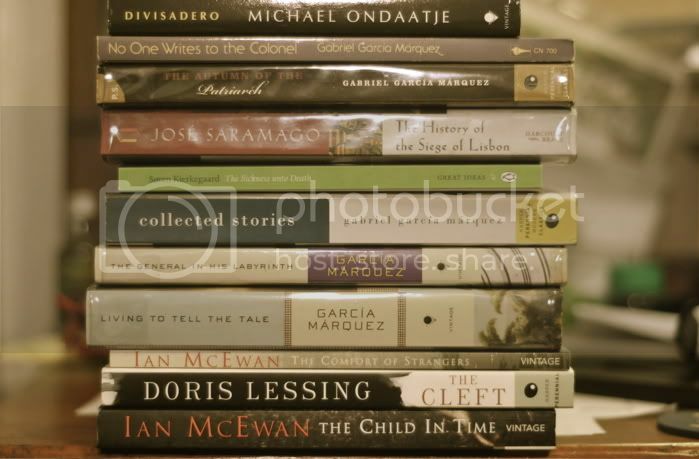 i doubt that garcía márquez would make for easy reading. i wanted to offer her a magazine instead. just this morning, i woke up at around 1am and for some unknown reason, picked up autumn of the patriarch, turned to the page where my bookmark had been, went back a page earlier, and began reading the later half of the last chapter. it had been an excruciating read, but this book must have been among those i've read in the shortest span of time, if you count the number of days that i've devoted to just reading it. i read and finished one hundred years of solitude during the holy week of 1994. it was the first garcía márquez that i have ever owned, and i bought it with money i won in an essay writing tilt back in college. since then, i'd read 7 of his novels, more than 25 of his short stories, and i'm still eager to discover his lesser known works, all of which has enthralled and mesmerized me with their adept use of images, and the gymnastics he's performed with language. autumn is particularly difficult, because he shifts points of views in the same sentence, and a scene could be described by as many as twenty persons, i am not kidding, particularly because the last chapter was actually only one, very long sentence. so in a way, this novel is a page-turner: while there are no surprises (we know from the beginning that the dictator is going to die), but you keep reading and reading, almost breathless, because you aren't allowed to pause, but you do pause because you're confused about who's talking and who is being described, but that confusion, you realize when you try to go back and make sense of this mishmash of beautiful narration, that this confusion is part of the story, so you continue, telling yourself, garcía márquez has one over me, or something like that. whew! after two garcía márquezes and a saramago, i think i'll relax a little and take it a little slow. perhaps i'll pick out another one of mcewan's. his on chesil beach was rich and evocative without asphyxiating me in the process. or i could try ondaatje. i haven't finished the english patientyet, but i'm intrigued by this newest novel of his. so i'm reading again! it feels good. Re: ha, ha, ha, ha. i became a fan of both mcewan and ishiguro at about the same time, after reading both their stories in a collection i had. ishiguro wrote "family supper", about a kind of fish found in japan which could be poisonous if not served properly, and which the father, whose business collapsed, served to his family. mcewan wrote about a mathematician who discovered some formula, and began folding himself until he disappeared. kaya lang, ishiguro's "remains of the day" is a sleeper (period piece). i looked at his other novel though, and the thickness of the book scares me! haha. remain's of the day is a sleeper? blasphemy. ok lang, you can skip the Unconsoled (very thick novel you might be referring to). Why don't you try When we Were Orphans. Chronicle of a Death Foretold, the writing is less obtuse, ha ha. Or Innocent Erendira, at least the stories are short. innocent erendira and her heartless grandmother and other stories, check. one hundred years of solitude and love in the time of cholera, check. in evil hour, leaf storm, the general in his labyrinth, no one writes to the colonel, memories of my melancholy whores, the story of a ship-wrecked sailor, all check. i've already read mcewan's on chesil beach (check a few entries back). i'm now reading his in the comfort of strangers, which is short so i should finish it this weekend, and as far as my garcía márquez collection is concerned, like i said, i'm only lacking some of his journalistic works, like news of a kidnapping. hehe.